(Bloomberg) -- Almost 15 months into the job, and the boss of South Africa’s state-owned electricity company is getting to grips with issues spanning corruption to defective power plants that threatened to collapse the grid. Hadebe said a “breakdown in corporate governance’’ and the financial viability of the business were the biggest challenges when he was appointed after President Cyril Ramaphosa took over leadership of the country. The CEO also faced increasing operational issues, forcing Eskom to implement periodic power cuts from December through March. Now the situation is under control, he said. The utility, which provides 95 percent of the electricity to the most industrialized nation in Africa, announced earlier this month a plan to minimize power cuts after an assessment with a technical review team identified the root causes of unplanned breakdowns. The cost of the new Medupi and Kusile plants has ballooned to more than 300 billion rand ($21.2 billion), and the discovery of defects will add further to expenses. Still, Hadebe said there are encouraging signs for the next boilers to come online. A new unit at Kusile was synchronized to the grid on April 14, the utility said. Ramaphosa in February announced plans to divide Eskom into generation, transmission and distribution units, as it joins other utilities in experiencing the so-called “death spiral.” That’s where demand is in terminal decline as alternative sources of electricity become available such as solar panels and clients switch to more efficient equipment like light emitting diode, or LED, lights. The split helps to achieve transparency and will allow for “clarity of operations” and more accountability by managers for the performance of stations and units, according to Hadebe. Revenue will continue to drop by 1 percentage point a year, which is about 2 billion rand, he said. 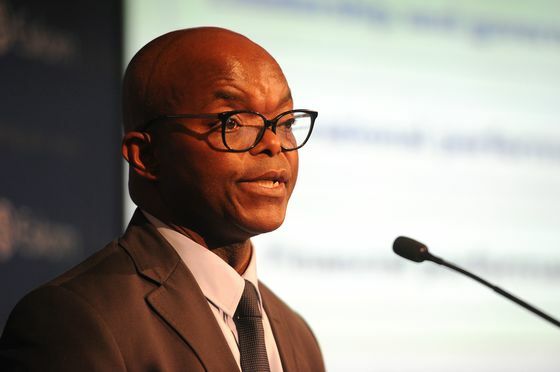 Eskom can make a difference by reducing costs, primarily through procurement and coal purchases, Hadebe said. When Hadebe worked at the Treasury until 2008, one of his responsibilities was to look at the financial oversight of state-owned companies including Eskom. The utility’s debt has since increased more than 11-fold to 450 billion rand, he said. The malfeasance, which boosted Eskom’s debt and the tackling of which was a large part of his original mandate, has largely been addressed, according to Hadebe. “While there might be pockets of corruption, it’s not that the tentacles start from the board,’’ the CEO said.